I remember the game was seriously lacking updates waiting for gen 2 that finally came out in February 2017. I was still playing the game every day mainly because I just enjoy going outside for a walk and catching pokemon. I was also still collecting candy to power up my 100IV Dratini. This is what I saw on the nearby when gen 2 dropped. I was at work though so I didn’t go get it. Also I wanted to evolve into Feraligatr on a lucky egg for the double experience. On the right is the first gen 2 pokemon that I caught. It was a Chinchou and I did keep it because it was useful to train against powerful Gyarados but it doesn’t really have much use now. 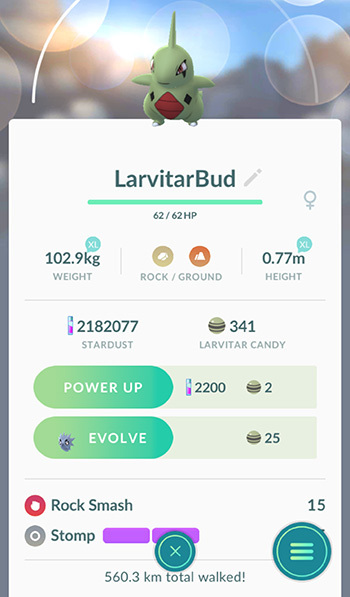 It took me so long to get my first larvitar. 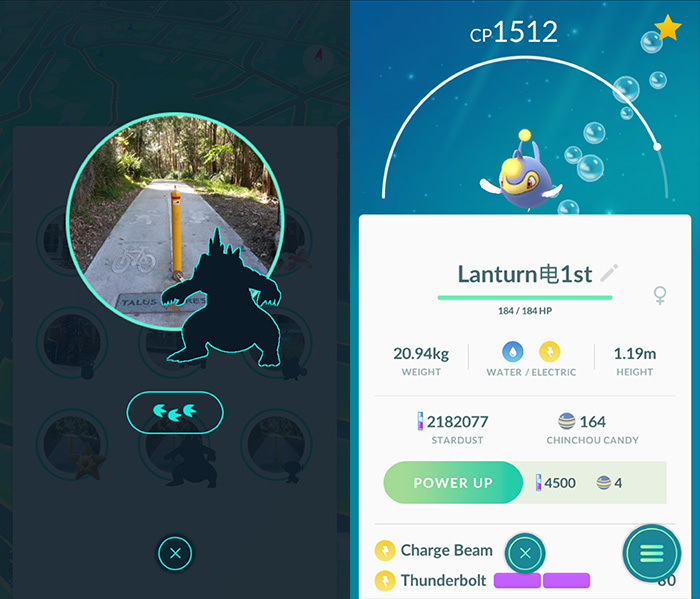 I got trolled a lot because I didn’t have a Croconaw either and it’s silhouette looked so close to a Larvitar. On the 4th of April 2017 I reached level 34. From here on I have screenshots for each level up since they took so long, but I won’t post them here since they’re pretty standard. The new gym system came later. I see pros and cons comparing this system to the old one but it’s probably more positive than negative. The main pros are it takes less effort to get your daily coins and I’ve had friends who are low level that have done next to no gym battles finally engage in the gym system since the rework. The sad part is that there didn’t really seem like a point to levelling up or powering up gym defenders any more. I did my first raid on the 24th of June 2017. There were 2 level 3s nearby but they were both Arcanines. I already had a 100IV one so I didn’t really care about it but I’ve still kept it to remember that day because it was an exciting day when the raid eggs first showed up. Then came the legendary raids on the 23rd of July 2017. I went to a local park not expecting anyone but 30+ people showed up and I just hung around until the raid boss de-spawned because it was so much fun. Having not played when the game launched it was awesome to see so many other players gather around playing together. haha RAIDS! One of the most exciting changes for a long time. That was so much fun. The Arcanine and then The Tyranny…! !